2018 Leaf vs Long Journeys — Can It Take The Heat? In this article, I will summarise some key characteristics of the 2018 Nissan Leaf, and provide some exclusive data. This is part one of a couple of articles in which we will look at the 2018 Leaf’s performance both in daily driving and on occasional long journeys, and see how the Leaf fits in with its peers. The 2018 Leaf has some particular design characteristics that make it a wonderful and great value EV in many areas, yet not always the most capable in other areas. 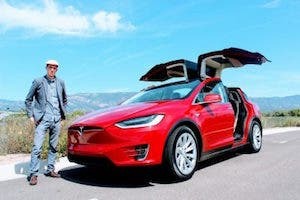 There has been plenty of confusion and there have been many questions raised about this (#rapidgate), and this article intends to provide a thorough review of the situation for those looking to buy an EV, or for current 2018 Leaf owners who are unsure of what the vehicle is capable of. 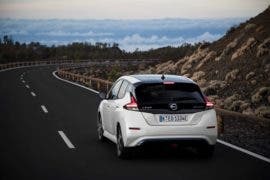 Depending on your intended use case and typical trip profiles, by the end of this article, and with the unique data it provides, you will have a much clearer idea of whether the 2018 Leaf is the right car for you. I have had generous data assistance in compiling this analysis from 2018 Leaf experts James and Johannes, so here’s an extra thanks to them. 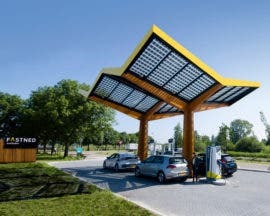 In regular daily use, EVs are extremely easy to live with, especially when it comes to “refilling the tank.” Electrical infrastructure and outlets are already widespread in most towns and cities around the world, and recharging an EV is typically a simple matter of plugging in where you park. For those who don’t have off-street parking either at work or at home, solutions are already available and more are on the way. There is no need to take time out once a week to go to a dedicated filling station when you can so easily plug in when you park at home or at work. Since the vast majority of people around the world live with 220–240 volt infrastructure, an overnight charge on even a standard plug outlet typically recharges at least half of your EV’s battery, which will be more than sufficient for regular daily use involving average commutes and local trips. However, on those longer journeys that most car owners make occasionally, when you need electricity mid-trip, you want a quicker recharge to enable you to get back on the road without too much delay. How much time will this take? Most societies have health guidelines about long-distance journeys that advise taking at least a 15 minute break roughly every 2.5 hours of driving. The UK highway code, for example, recommends 15+ minutes every 2 hours. Those of us who travel with children or pets know that we will likely be taking somewhat longer or more frequent breaks than these recommended minimums. These are typical patterns on a long distance journey, and for EVs to replace gas cars completely, they need to be able to approximate these patterns that folks have come to expect from gas cars. Carmakers who want to provide all-round capable EVs take these requirements for decent highway driving duration and fast-charging capability seriously. Those who are currently only making EVs as compliance cars or city-only cars often do make cars that meet these requirements, and so long as that is clear to potential buyers up front, that’s also okay. It’s worth remembering that most car-owning families worldwide own just one car. The car, therefore, should be a capable all-rounder for all use cases, including occasional longer trips. We don’t have one car for commuting, and a different car for longer trips on vacation and family visits, and yet another car for weekend thrills. The best designed all-rounder EVs have ranges that allow at least 2 hours of highway driving between charges, with fast charge times that currently take 30–40 minutes to regain another 2+ hours of driving. 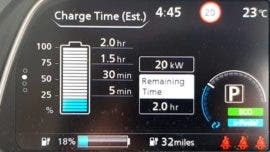 Although that’s currently a bit longer than the 15+ minutes noted above, it does fit well with a quick meal break, and the fast recharge times are improving year on year and will approach 15 minutes in the leading EVs in the near future. All the amazing benefits of EVs make the current 30–40 minute rest breaks in the best current EVs a non-issue for the majority of occasional road trippers. So, where does the Leaf fit in to this spectrum of road-trip-ready EVs? The Leaf is a competitively priced EV with many compelling features, and stands well with its peers in many areas. It has longer range per charge for daily driving than many of its rivals, even those at higher prices (BMW i3 and VW E-Golf). It offers a compelling combination of comfort and refinement, brisk performance, amazing one-pedal driving, brilliant safety features, spaciousness, excellent reliability, low-cost of ownership, and a very competitive price. It has won numerous awards, including; CES 2018 Best of Innovation; Kelly Blue Book 2018 “Lowest cost to own;” What Car? 2018 “Best Electric Car;” and “2018 World Green Car” award at the NY Motor Show. 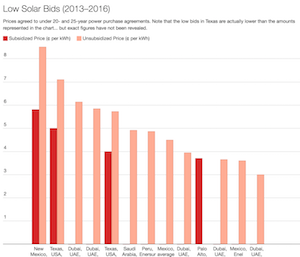 So it’s a pretty great EV in many respects and great value for many use cases. So what is it about the Leaf’s design that limits its fast charging ability? It’s all due to the Leaf’s battery temperature management system, or rather, the lack of one. 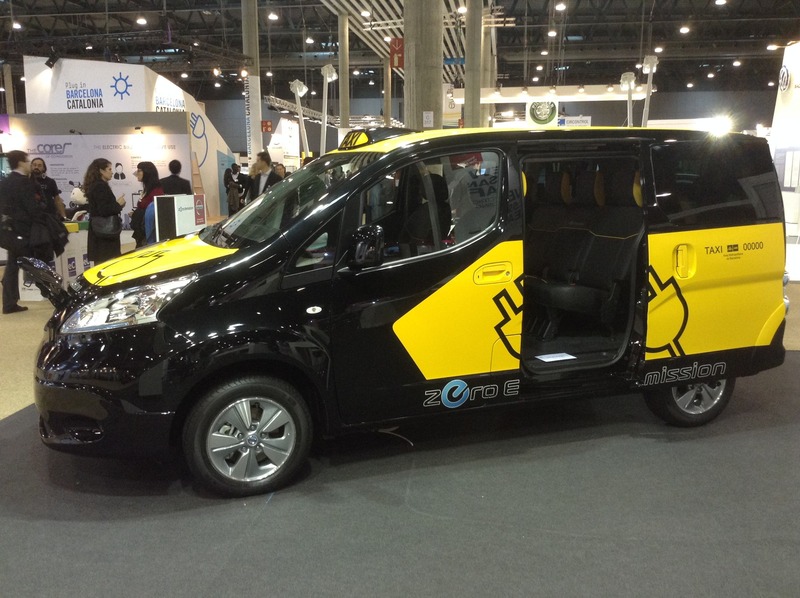 The e-NV200 and most other EVs are designed to actively manage their battery pack temperature in some way. The 2018 Leaf, just like its earlier iterations with which it shares its basic technology platform, has no active thermal management system. EVs are very energy efficient compared to gas cars and the energy lost to heat in an EV is actually a very small fraction of the total. Gas cars typically lose 75% or more of their energy to heat. Although EVs are relatively efficient, the energy lost to heat in EVs is not zero, and a full EV battery does contain a huge amount of energy. Mainly due to internal resistance in battery cells, when the battery is inputting or outputting power (i.e., when the car is charging or driving), there is some heat generated in the battery pack. This happens in all EVs. 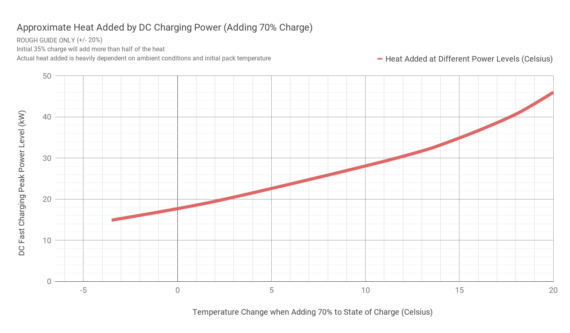 On short local journeys driven at medium average power, or charging at medium power (AC charging at home or work for example), the heat generated usually has a modest effect on the overall temperature of an EV’s battery pack. In these scenarios, the pack’s temperature usually stays within reasonable limits. Why is it important to avoid excessive heat? A battery can be damaged when it gets hot, especially if this happens frequently and for prolonged durations. This damage results in reduced ability of the cells to retain a charge, reduced energy capacity, and an overall shorter service life. The exact details of what temperatures (for how long) cause such damage vary depending on the battery cell chemistry. Generally it is good to try to avoid frequent exposure to temperatures much above 50°Celsius (122°F), though occasional low 50s temperatures are not something to worry too much about. When properly designed, EV battery packs can last for hundreds of thousands of miles or more. Although daily driving does not cause excessive heat, there are situations that cause much more heat, so let’s look at those next. When the battery pack has to sustain high power levels — either input power (charging) or output power (driving) — for prolonged periods, this will generate significant heat. The extent to which it generates heats depends on lots of things, but the main one that causes internal resistance and adds temperature is the flow of current (amps), and the main ones that remove temperature are basic heat transfer (mainly via simple air convection) and — crucially — any additional active cooling system that the carmaker has designed into the vehicle. These active cooling systems might be based on liquid cooling using circulating fluid and a radiator — as exist in the EVs of Tesla, BMW, GM, Hyundai, Renault and others — or, as in the Nissan E-NV200 (and the Kia Soul EV), cooling may be based on a simpler system that uses fans and ducts to redirect cooler air from the air conditioning system through the battery pack when necessary. 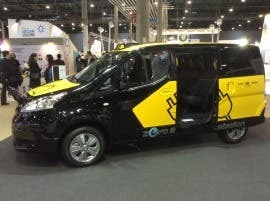 For example, Nissan describe their E-NV200 system very simply — “cooled air from the vehicle’s heating and ventilation system is channelled over the battery cells.” This basic system proves mostly adequate in the e-NV200 to provide an extra cooling boost (in addition to the passive heat transfer) when required, and results in preventing excessive heat built up in the battery pack. On the right is an illustration of a very similar cooling system in the Kia Soul EV. 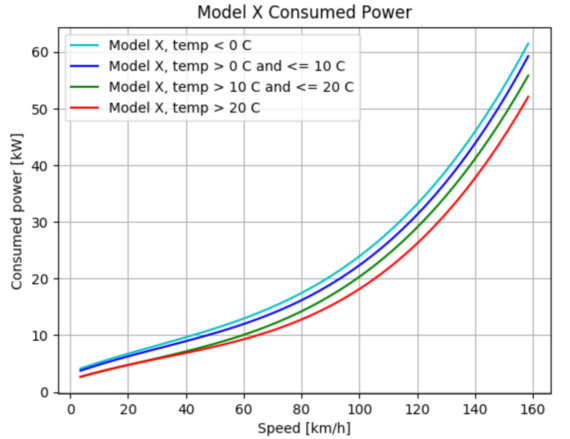 This clearly demonstrates that, even for an aerodynamically efficient vehicle, the power required to maintain 120 km/h is around 3 times that required to maintain 60 km/h. Beyond 120 km/h, the power required gets even more extreme. Sustaining 160 km/h requires around 4× the power of sustaining 80 km/h. It also means you will get near 4× the range travelling at 80 km/h than you would at 160 km/h. The same trade-off between speed and power needed is true of all vehicles. Heat generated in the pack is approximately a square function of the power level, so double the power generates much more than double the heat. For this reason, higher speeds generate exponentially more heat than lower speeds. 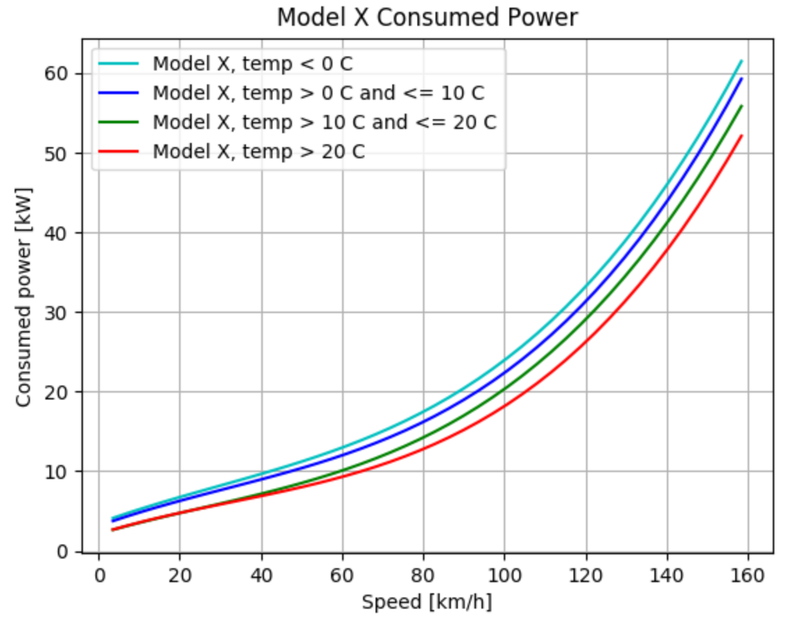 The only slight consolation for a passively cooled EV like the Leaf is that the rate of cooling is also typically greater at higher speeds (due to much greater airflow increasing heat transfer). However, cooling typically cannot even nearly keep up with the extra heat generated by the higher power levels. We will look more into real world examples of these relationships in the second part of this article, and what driving patterns they point to for best managing heat. In many countries, highway speed for cars is usually in the range of approximately 110–130 km/h (68 to 81 mph), for prolonged periods. EV drivers naturally want to be able to drive at the same speeds as the other highway traffic. To give some specific examples, the highway speed limit in Canada is 110–120 km/h, in the UK it is 70 mph (113 km/h), in continental Europe it is around 120 km/h (Spain and others) or 130 km/h (Austria, France, Italy, and others), and in China it is 120 km/h. In decent conditions, most car drivers expect to drive at or close to the speed limits on highways. This requires a lot of power, more so the higher the speed, which causes a significant buildup of heat. The other high-power situation which causes significant heating is DC fast charging, which, as we saw above, is required to refill the battery at intervals during a long journey. DC fast chargers are typically capable of delivering sustained power to the EV battery pack in the range of 50 kW and some are capable of delivering 100 kW. Whilst 50 kW is currently the most common maximum output of most DC fast chargers, a new generation of DCFC infrastructure is now rolling out that is capable of delivering 150–350 kW. This is in anticipation of the advent of EVs that are capable of receiving power at these levels in the near future. The capability to receive close to 50 kW DCFC is designed into almost all modern EVs, and some can accept much more charging power than this. The EV usually communicates with the charging station to request certain power levels. When a battery pack receives input power at close to 50 kW (or in some cases higher) over the course of 30–40 minutes or more, it causes very significant heat generation in the cells and in the overall pack. Again, the relationship between power level and heating is approximately a square function, so the rate of heat generated when charging at close to 50 kW is much more than 5 times greater than the rate of heat generated on a home or workplace charger that typically delivers 7 to 11 kW. Clearly, these two high-power situations — high speed driving and high-power recharging — can result in excessive temperatures that passive heat transfer alone may not be enough to counteract. These are precisely the occasions when an active cooling system (either liquid based or simple cold air blowing) is useful to prevent damaging levels of overheating. If a manufacturer has not included any such active cooling system, it tells us that the company mainly intended its EV to be used for shorter journeys (i.e., commutes and city driving), and rarely used for DC fast charging. As mentioned above, if a manufacturer is up front about this, then that’s fine and clear. Ultimately, EVs will have to be all-round capable vehicles, but some households have more than one car, and an EV designed primarily for local driving can still sell to such folks as an efficient and capable city car driven mostly for short durations and/or at modest speeds. However, if there’s no active cooling system and the manufacturer does still claim its EV is an all-round capable vehicle, there will be problems ahead. Folks who are expecting an all-round capable vehicle will expect to be able to make occasional longer journeys at normal highway speeds, and also to be able to quickly charge up during such long journeys. If a car is presented as being all-round capable but cannot consistently perform in these ways, customers trying to make longer highway journeys may be disappointed. 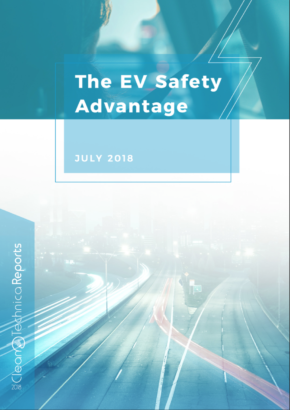 Especially customers who are coming to EVs for the first time, have little experience of what to look for, and are relying on the manufacturer’s marketing claims when making their purchasing decision. There are two mainstream EVs that do not offer any active thermal management system for cooling the battery pack. One is of course the Nissan Leaf, which we discuss more below, and the other is the VW e-Golf. 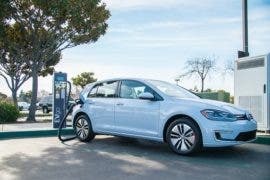 VW has already discontinued selling the e-Golf in several markets, and is talking about releasing more compelling EV designs in the years ahead. To the company’s credit, its marketing materials for the e-Golf have made it fairly clear that it always intended to position this EV as a city/commuting car, calling it “… an urban adventure vehicle ready to go out on the town and back” and using the tagline “Give the city a jolt of energy.” VW also states in its marketing materials that “frequent and consecutive high-voltage charging (including DC charging) can permanently decrease the capacity of the high-voltage battery. See owner’s manual for details.” The owner’s manual states that two consecutive DC fast charges is the maximum permissible if you don’t want to void your warranty. It would be better to state this limit up front, and not just in the manual, but at least VW makes some clear mention of the limitations. 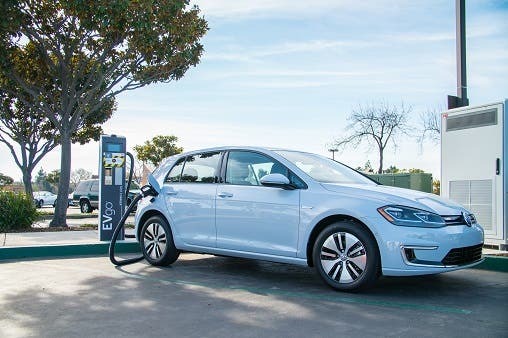 Additionally, and as part of its heat management strategy, VW designed the e-Golf to only accept moderately high levels of power during each DC fast charge. The maximum charging power received by the pack peaks at 38–39 kW, rather than the typically 45–49 kW more commonly seen in EVs. Obviously, at this slightly lower power level, whilst less excess heat is generated, the recharging takes about 20% longer than it would take at closer to 50 kW. Again, to its credit, VW was up front about this and only ever claimed that DC fast charging could recharge the e-Golf’s battery to 80% within an hour, carefully managing customers’ expectations. 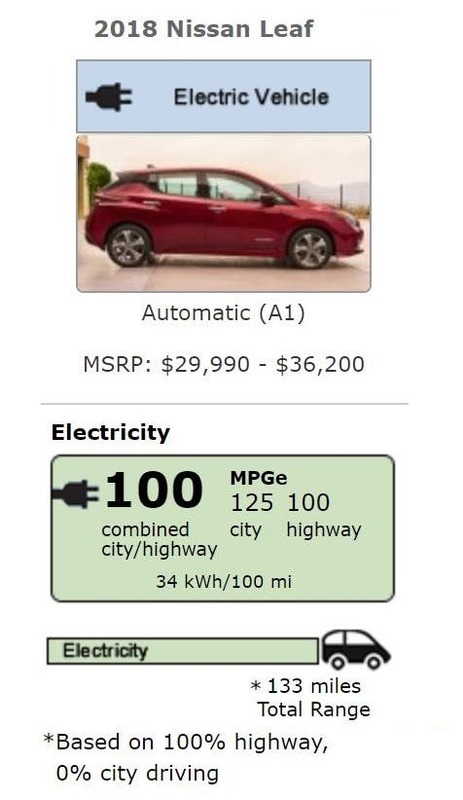 The 2018 Nissan Leaf is the other mainstream EV with no active thermal management. This being the case, we might have expected the company to market this as a city car and only make modest claims about recharging speeds (as VW has done with the e-Golf). Let’s see how Nissan has marketed the Leaf. 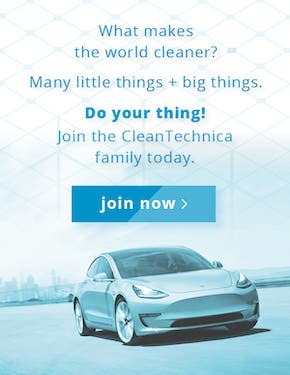 This kind of marketing certainly suggests to any reasonable person that the Leaf is capable of sustaining typical highway speeds, and that it is “more than just a daily commuter.” This marketing information seems to give no indication that there is any restriction in being able to do long-distance highway journeys. This certainly makes the Leaf appear to be an all-round capable EV. But is it? What Happens to the Leaf on a Long Journey? Of course, if you do make a longer journey that exceeds the highway range of the Leaf, as with any EV, you will need to do one or more rapid charges along the way. It’s good to make sure you have a 100% full battery, best done via a slow overnight AC charge before setting out on a long drive. How far will you get on a longer journey? The 2018 Leaf’s official EPA highway range is 214 km (133 miles) from 100% state of charge down to empty. However, the EPA test is conducted assuming favourable environmental conditions, and at average driving speeds of around 77 km/h (48 mph), and the official highway figure is not representative of more typical highway cruising speeds. I’m not singling out the EPA’s methods here — the other common evaluation standards are even less realistic (and if these were improved, it would remove a lot of confusion for buyers). As we saw above, the typical highway speeds in most countries range from 110 to 120 km/h (68 to 75 mph) or more. At constant speeds of 110–120 km/h (68 to 75 mph), the Leaf’s range will usually be closer to 177 km (110 miles), even in ideal environmental conditions. I’m talking here about true (GPS measured) speeds, not the speed indicated on the Leaf’s speedometer. The latter overstates the true speed by roughly between 5% and 10% depending on your tire choices. In general, you should only count on driving down to perhaps 10% battery state of charge before recharging, rather than down to completely empty and risk being stranded. Therefore, the actual highway range between charges at normal highway speeds of 110–120 km/h (68 to 75 mph) will be around 100 miles (161 km). It will be a more in ideal mild-to-warm conditions, and less in cold wintry conditions. The 100 miles (161 km) is the approximate range in reasonable driving conditions (mild temperatures, insignificant headwind, well paved road, etc.). Highway range for an average driver will be lower outside of these ideal conditions. Experienced EV drivers will of course be able to get a lot more range when driving significantly slower and much more gently, but for first time EV drivers coming from gas cars, driving in the style they are used to, the above figures are more realistic. In reality, then, even starting with a full battery, a typical highway speed journey of over 100 miles (161 km) will require making at least one DC fast charge. Normally, you would then charge to around 80% on a DC fast charge, since, just like your mobile phone and other battery powered devices, the charging rate can be relatively fast to around 80%, but gets much slower when charging beyond that (to protect the battery). Usually, it’s not worth waiting around to charge much above 80%, but instead better to get back to driving. The 2nd and subsequent stages of your journey will thus be starting at only around 80% of the battery energy, rather than the 100% that was available in your initial stage. You then drive down to 10% again, and recharge again. Driving from 80% to 10% is about 20% less than the first stage (100% to 10%), so at typical highway speeds, your second stage range in the Leaf will be about 80 miles (129 km) in real-world conditions. So any highway speed journey much over 180 miles (290 km) will need a 2nd DC fast charge. Over 260 miles (418 km) will need 3 charges, and each additional ~80 miles (129 km) distance will need an additional DC fast charge. Obviously, then, on 180+ mile (290+ km) highway speed journeys that must include at least 2 DC fast charges, the speed and duration of those charges becomes an important factor in the total duration of your journey. And the more charges your journey distance requires, the more important charging speed becomes for the overall duration of that journey. 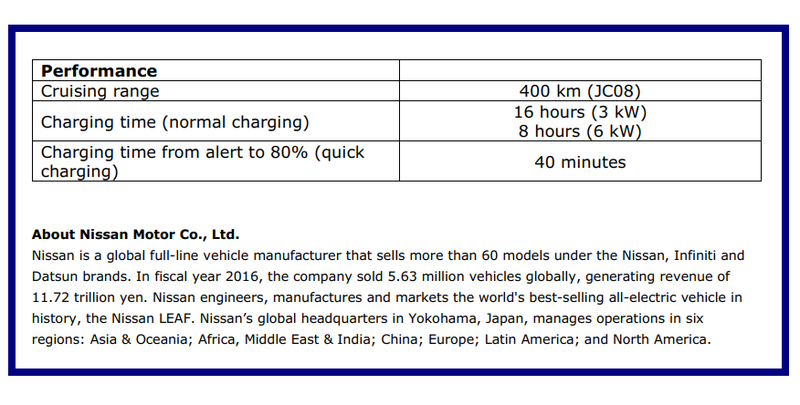 Anyone looking at Nissan’s marketing materials would be expected to conclude that there is no major problem, because Nissan originally marketed the Leaf as being able to recharge from low battery alert (approximately 9% state of charge) to 80% in 40 minutes (see the table here from Nissan global). Whilst that’s not quite as fast as some other EVs, it sounds pretty decent. It would still seem to enable comfortable and manageable longer journeys at something close to normal highway speeds if you don’t mind stopping every one hour and 10 minutes for a recharging break. On paper, the Leaf sounds capable of making comfortable longer journeys. But, unfortunately, for owners expecting to be able to do occasional longer journeys in the Leaf, there’s something that Nissan is failing to mention in all these marketing claims. Because it has no active cooling mechanism to control temperatures during high power conditions of a DC fast charge, if the heat is building up and risks exceeding 50 degrees Celsius, Nissan has only one option to control heat gain. Similar to what happens with the e-Golf, when heat builds up, the 2018 Leaf is designed to simply reduce the power of the charge in an attempt to reduce the rate at which further heat is generated. A typical full power charge from 10% to 80% (a normal charge session in a mid-trip situation) when the battery back is cool involves a peak power level of 46 kW. Such a charge can add as much as 20° Celsius to the pack temperature. 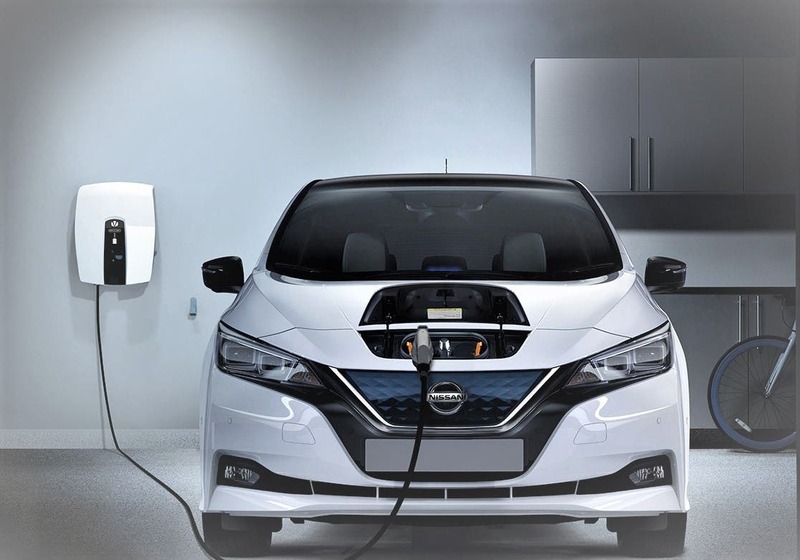 Nissan’s work-around solution is to measure the battery temperature when starting the DC fast charge, and if it is already above 32° Celsius, then the Leaf requests a reduced charging power level, which will add comparatively less heat. Of course, if the pack is already very close to 50° Celsius before charging, it’s important that no further heat is added. 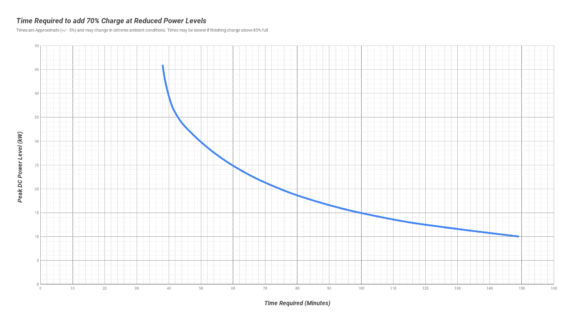 To add no net heat, the power level of the charge has to be low enough that normal passive heat transfer (that we discussed previously) counteracts any additional heat generated by the charging power. Since passive heat transfer is usually pretty slow, especially when the vehicle is stationary, in this case the Leaf sets the power level pretty low. For example, if the pack is already at 48° Celsius, the charging power level is set to 20 kW maximum. Although this does manage the heat, it also obviously results in a pretty slow “fast charge” compared to a charge at unrestricted power levels. 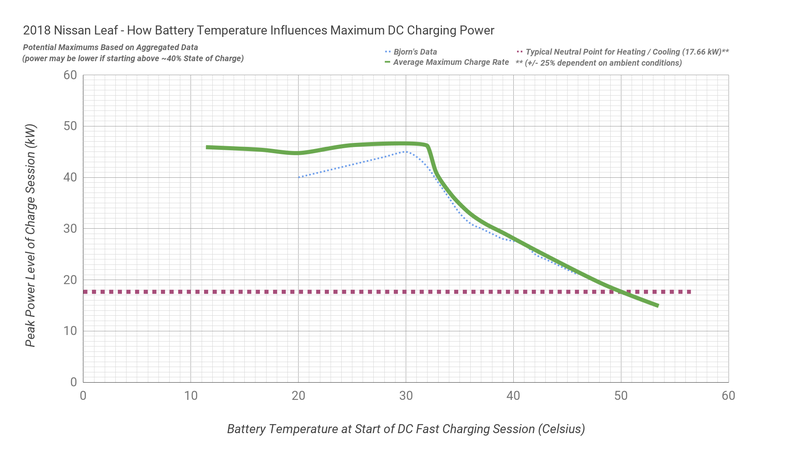 Below is a look at the relationship between the battery pack heat when initiating a DC fast charge and the maximum power level that the Leaf requests from the charger. 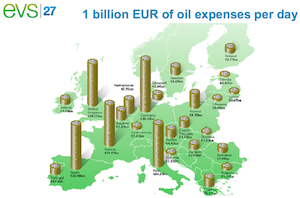 (I thank Bjorn Nyland for also contributing some data to this part of the analysis). 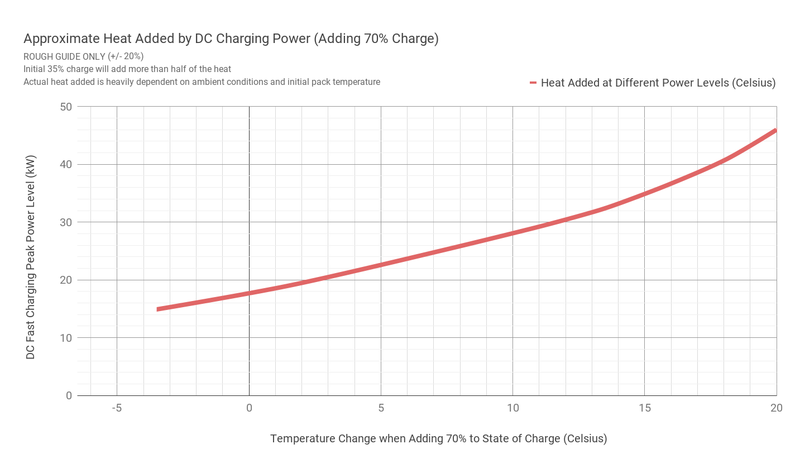 If the pack is already at anything above 50° Celsius, the DC fast charge is so highly throttled that under most conditions the pack will have a net loss of temperature through passive convection, even though some additional heat is being generated by the charging power. This “cooling feature” is typically below 15 kW, causing agonisingly slow recharge times, since the battery is pretty large. At reduced peak charging power, many of these charging durations are obviously a very long way from “40 minutes.” Nissan apparently never warned buyers about this power throttling characteristic in advance. 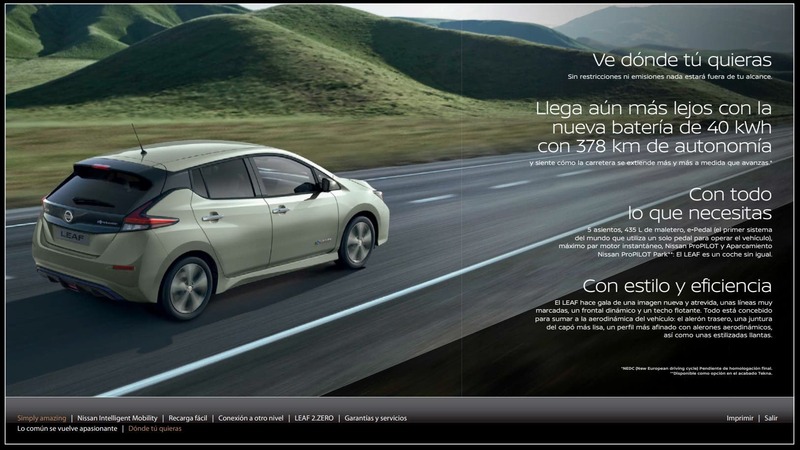 Indeed, as of July 2018, Nissan Canada, Nissan Spain, and Nissan global still show marketing materials that claim 40 minutes charging to 80% (see the brochure links and the table from Nissan global in the previous section). The marketing information of Nissan UK, Nissan Germany, and Nissan France is now saying 40 to 60 minutes, or simply 60 minutes, but certainly in the UK there are many folks who already bought the Leaf when the claim that was indicated was still at “40 minutes to 80%.” Even 60 minutes does not come close to covering the cases that will often happen on longer journeys driven at normal highway speeds. The BBC recently covered this issue and interviewed some UK Leaf owners who feel misled by Nissan. The BBC also reports that the UK advertising standards agency is considering whether to launch an investigation into the case to determine if there were any misleading claims made in marketing materials. I’m not a lawyer, so I’m not going to take a position on this. From what I’ve seen, however, it’s certainly possible that people in the UK and elsewhere may have bought the Leaf with no idea about how it diverges from “40 minutes to 80%” in typical long-distance driving scenarios. Given the vehicle’s characteristics, combined with how it is marketed, it might look to some people as though Nissan is trying to have it both ways with the 2018 Leaf. It certainly looks that way to me. Building on the previous iterations of the Leaf platform (which made its debut in 2010), in the 2018 version, Nissan has still not added any active thermal management system to the vehicle. 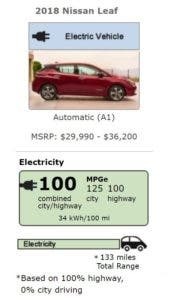 As we have seen, apart from the e-Golf, this makes the Leaf unique in its class, since all other mainstream EVs do have active thermal management. The Leaf’s larger sibling, the e-NV200, also has a basic but effective thermal management system that simply redirects cold air from the existing air conditioning unit through the battery pack by means of some ducts and fans. These minor added components surely would not have been prohibitively expensive to add to the Leaf’s design, and they would have completely transformed the Leaf’s capabilities. Whatever the reasoning, Nissan evidently did not go this route with the 2018 Leaf. Without an active thermal management system, any EV will necessarily struggle to control heat during highway speed driving and during DC fast charges, as I have outlined above. And the Leaf does indeed struggle in these use cases. 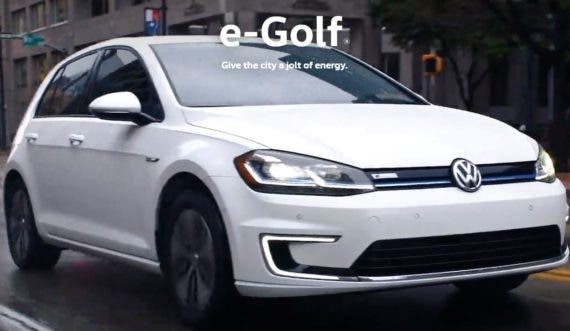 An EV which is not engineered to face sustained high power conditions should only really be marketed as a city car, as the e-Golf has been. But despite the 2018 Leaf’s thermal management limitations, Nissan seems to have not wanted to market the vehicle as just a city car, but rather as an all-round-capable EV. This positioning has led to some disappointed EV customers, which is not great for EV adoption as a whole. Despite these limitations, the Leaf is at least capable of making reasonably normal patterned journeys of up to 180 miles (290 km). And for such journeys, it is generally a fantastic EV and good-value vehicle overall. For those owners who want to occasionally make longer trips than this, we can outline what to be aware of when making such trips. We can also suggest how these longer journeys should be approached, and with what “heat management strategy” adopted by the driver. I will cover this in my next story.